MythZoneMinder is a plugin to interface to some of the features of ZoneMinder. You can use it to view a status window similar to the console window in ZM. Also there are screens to view live camera shots and replay recorded events. Other features may be added at a later time if there is sufficient interest. 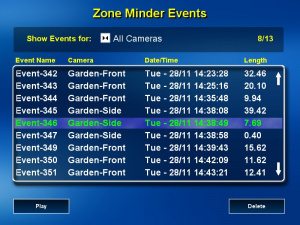 Requires a small change to the ZoneMinder source code for the Live View to work. 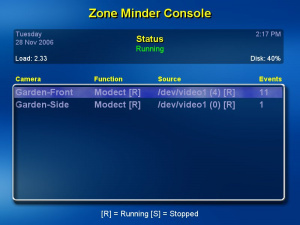 ZoneMinder must be running on the same machine as you are running the frontend. The plugin uses OpenGL to render the video frames so you must have a working OpenGL setup. The utilities provided by ZM are currently designed to be run by the web server user so in order for the plugin to use them requires configuring sudo to allow the mythtv user to run them as the apache user. More details on how to do that below. 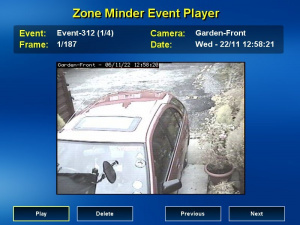 You must already have a working ZoneMinder installation. The plugin has been tested with version 1.22.2 but 1.22.3 may also work but is untested. Currently ZM must be on the same machine that is running the frontend. The current version of ZM requires a simple one line change to allow the plugin read access to its shared memory. The ZM author is aware of the limitation and future versions of ZM will allow the permissions on its shared memory to be set via a config setting. and recompile and install ZM. If you don't want to do that and would like to test the plugin you could run mythfrontend as root which will allow it to read ZM's shared memory. PLEASE NOTE: This plugin requires MythTV svn rxxxx or later from trunk and will NOT work with the fixes branch. added as a parameter when running the configure script Then compile and install the plugins in the normal way. The current version of ZM is setup to only allow the web server user (apache) to run the utilities provided by it. It is possible for other users to run them but they usually fail with permissions problems or return invalid results. The plugin uses one of these utilities (zmdc.pl) to get the status for the main daemon and the monitors. In order to get this to work properly requires setting up sudo to allow the mythtv user to run zmdc.pl as the apache user. The ZM author is aware of this and it is hoped that the next version of ZM will allow the user and group that ZM uses to be configurable to allow us to add the mythtv user to the ZM user group. The first thing you should do is go to MythZoneMinder's settings page and make sure the settings there are correct for your system. Currently the only setting is to set where ZomeMinder keeps its zm.conf configuration file (usually /etc). All the other settings required are read from this config file. The live screen shows live views from any available monitor. Currently there are views to show 1, 2 or 4 monitors simultaneously. Above each monitor view is the camera name and the current status eg idle, alert or alarm. The event screen shows a list of all stored events. You can filter the list to show events from just one monitor or all monitors. Events can be played of deleted as required. UP/DOWN - Move focus to the next/previous widget. When the camera list has focus they change the selected item in the list. LEFT/RIGHT - Move focus to the next/previous widget. When the camera 'selector' widget has focus they change the selected item. Allow ZM to be running on a machine other that the frontend machine. This will have to wait for me to eventally get a dedicated BE machine setup in the loft.